Welcome to the best of both worlds. 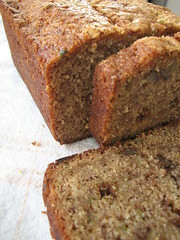 My childhood banana bread meets the zucchini bread and they live happily ever after. I love this bread because it’s sweet, dense and moist. It doesn’t fall apart if you want to slather on the jam or butter. And it’s lower fat and has lovely omega’s (from flax) to boot. The thing that I love about “tea breads” is that it tastes like dessert but I was allowed to have it for breakfast. Aptly named a tea bread, it is also acceptable for the British custom of tea time. And even though it has plenty of sugar, there are vegetables involved so don’t be scared. Bananas are high in B6 and magnesium. Bananas and zucchini both contain potassium, Vitamin C and obviously are full of fiber. The humble zucchini also has plenty of Vitamin A. Luckily, they both store well and where I live, zucchini can grow like a weed. When I have a huge crop of zucchini in the garden, I grate it, measure it out and put them in labeled ziplock bags so that I don’t burn out on zucchini bread all at once. I tend to get too many bananas at once and instead of letting them go bad and cry about it, I freeze those too. To freeze bananas, I peel them and put them on a cookie sheet and freeze them for about an hour. (this step is so that if they are overly ripe, they don’t freeze together and become a big mass) Then I transfer them to ziplocks and store them in the freezer. I love freezers and their ability to happily handle the fact that I cook for 6 in a family of 2. Whenever I make dinner, I freeze half of it for the eventual lazy day when I want home cooked food but don’t want to wait or go out to eat. Anyways, I’m sure you are ready for the recipe so here it is! Oh, and if you are interested, one of my grandmas goes by the name Keane, so she gets a bread named after her. Enjoy my revamped vegan bread for breakfast, dessert or any old time. My favorite way to eat this bread is warmed and smothered in cream cheese. Preheat oven to 350 deg F and lightly grease a loaf pan. In a bowl, mix the oil, applesauce, sugars, flax and water. Add the bananas and vanilla and mix well. Fold in the zucchini and set aside. In a separate bowl, sift together the flour, baking soda, baking powder, salt and spices. I usually just sift the baking powder and soda and mix it all together with a fork or whisk. Add the dry ingredients to the wet ingredients and mix it until most of the flour is incorporated and no large lumps remain. Fold in the nuts if using and pour immediately into your greased pan and put in the oven. Bake for 60-75 minutes, or until a knife/toothpick inserted comes out clean. It will firm up if you let it cool for a bit but if you can’t wait, don’t listen to me. This bread keeps for 3 days on the counter, a week in the fridge and forever in the freezer. If you freeze it, cool it completely then wrap in plastic wrap and then wrap it in foil. Defrost in the fridge overnight. I try to keep a loaf in the freezer at all times in case there are unexpected weekend guests. Oooh that looks scrummy and it’s making my tummy rumble! I love tea bread too! 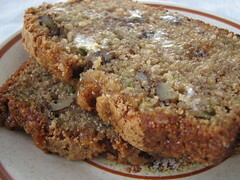 Especially whole wheat banana walnut bread. I always put peanut butter on mine. I guess I didn’t realize how much food you freeze. I’m always a little nervous to freeze entrees, in case they don’t come back well. I froze potato-leek soup once, and the texture was oddly chewy when I reheated it. Any tips? I’ve had the same experience with a potato celery soup I made. Maybe potatoes just don’t freeze nicely for texture. If I figure it out, I’ll let you know. I have no problem freezing bean soups and other vegetable soups. That bread looks delicious, thank you for sharing the recipe. This recipe is a new favorite of mine. Have made it 3 times now for events where I needed to bring something–it has been a hit every time. I like it with a dash of cinnamon and nutmeg added in. Yum–thanks for the idea, I wouldn’t have thought of combining bananas and zucchini but they pair well! I’m so glad you’re enjoying it CarrotSoup! Yes, cinnamon and nutmeg are the perfect additions! I don’t know why I didn’t think of it. Wow- this is a great recipe thank you for sharing….I found your link on Zoey’s Kitchen and made the muffins and mini muffins for my wee ones. This is a fantastic treat! The first time I made them it completely overflowed my pan, but it still tasted amazing. The second time I made them, I doubled the recipe and made three loaves (my loaf pans are all 8.5×4.5 not 9×5). YUM! Also, I used less cinnamon, no nutmeg and more ginger. I have wintery connotations with cinnamon and nutmeg so prefer more ginger in the summer. The first time I made this, it was gone in under a day… We’ll see how long three loaves last (just baked them today). Thanks for the lovely recipe! Thanks for the input regarding pan sizes. I tend to bake at least 2 loaves at once…they freeze and defrost really well. I like to have a loaf in my freezer at all times for unexpected guests. Yay! Glad you found it and are making the muffins. I love the recipe too…but I am working on making it less moist right now.